Larry Dixon considers himself a very fortunate young man. He has a beautiful wife, a great family and he is doing what he loves to do for a living. And what he does is drive a Top Fuel dragster, the quickest accelerating vehicle in the world. Over the course of his career as a driver, which goes back to 1995, Larry has amassed a record that any driver would be proud to have on their resume. 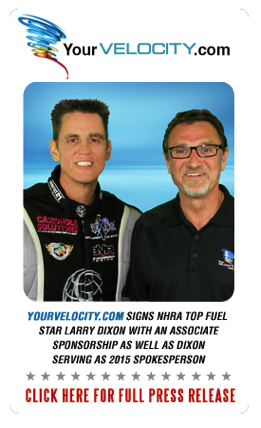 Top Fuel dragsters are the premier class in NHRA drag racing, one of the most popular sports in the country, and Larry is in the top four in every statistical category in the class. That includes his 62 wins, 51 top qualifying spots, 46 low elapsed time runs and 33 top speed passes. 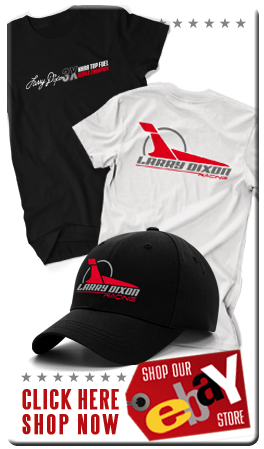 It was those kind of performances that have enabled Larry to win 3 NHRA Full Throttle World Championships so far. Larry knew at an early age what he wanted to do for a living. Having grown up in Southern California, the hot bed of drag racing in the formative years of the sport, Larry grew up watching his father race.  The senior Dixon was one of the pioneers in the sport and Larry got to see, first hand, what it took to build a winning team. After working as a crew member on several teams in the 1980’s, Larry finally got the opportunity to drive in the Top Alcohol Dragster category in 1993, and while it wasn’t a Top Fuel car, it still went over 200 miles per hour and Larry knew right away that, while working on a car was fun, driving was a real thrill. Larry crewed for drag racing legend Don Prudhomme for six years, and when Don announced that he was going to retire as a driver at the end of the 1994 season, he also announced that Larry would be his new driver. For a kid who grew up idolizing the man they called “The Snake,” the opportunity to drive his car was a dream come true. 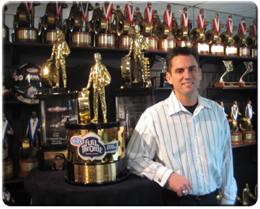 With Prudhomme showing his keen sense for talent, he watched Larry win his 1st NHRA National event in his 2nd start. The rest, as they say, is history. For the next decade and a half that Larry drove for Prudhomme, he learned more than just how to drive a car. He learned how to interact with the fans, how to work with sponsors, run the business side of things, and how to be a spokesman for the sport he loves. 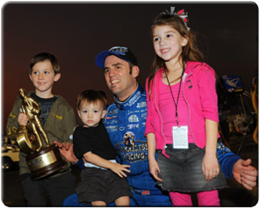 All of this helped make him one of the most popular drivers in the sport. Whether it was with Miller Brewing, U.S. Tobacco Company or any of the many sponsors that were associated with his teams over the years, Larry handled his duties, both on and off the track, with professionalism. Australia witnessed its quickest ever drag racing pass last weekend at Willowbank Raceway when three-time NHRA Top Fuel Champion Larry Dixon stormed to a 4.503 second quarter-mile time. Dixon's incredible run came after a dramatic incident Friday when the Rapisarda Racing dragster sheared an axle, seeing a wheel come off the car and send it on a 360 spin down the track! Click Here - To get more on this incredible weekend of racing in Australia.